Ever wonder what happens when you crossbreed a bridge and a gondola? 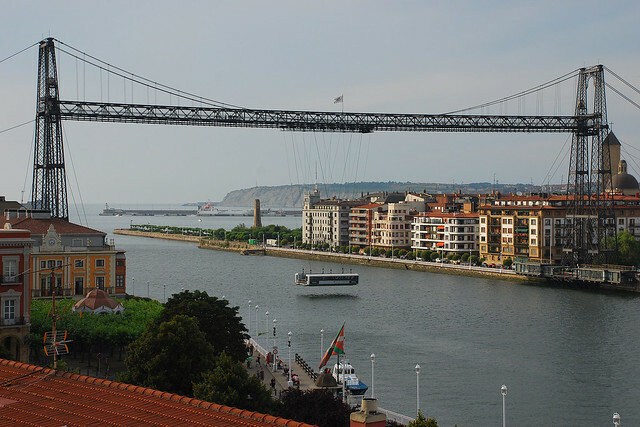 Well if infrastructure could reproduce, it’d probably look a lot like the Vizcaya Bridge in Northern Spain. Vizcaya Bridge with suspended gondola in middle. Image by Flickr user Thomas Roland. Vizcaya Bridge. Image by Flickr user Ian Turk. First designed and constructed in 1893 with the latest 19th century building techniques, this 45m high and 160m long transporter bridge has been ferrying passengers across the Nervión river for 120 years! The 90 second suspended gondola ride leaves every 8 minutes during the day — or approximately every hour at night. It has the ability to transport 200 persons, 6 cars and 6 motorcycles/bicycles each time it traverses the river. 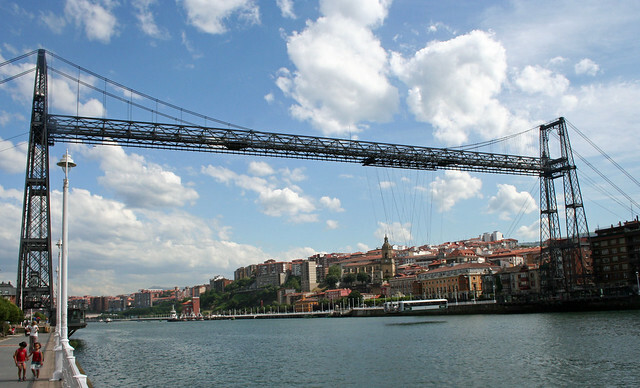 And perhaps to encourage greater use of the bridge, the Vizcaya is actually fare integrated with Bilbao’s travel card system, Creditrans, while passenger tickets are extremely affordable, at only USD$0.50. Aside from a few other shuttle bridges — most of which are now unfortunately no longer operational — the Vizcaya remains the most successful and arguably, the most architecturally stunning example. As an official recognition of its significance to the region and world, it was declared an UNESCO World Heritage Site back in 2006. Today, the bridge is a major tourist draw and each day over 300 shuttle trips are made with an estimated four million passengers and half a million vehicles transported each year! If it had an elevator at each end and a walkway between them then it'd be even less wait for pedestrians. @ Matt They actually installed lifts in 1999 which allow you to access the top and walk across. But here's the thing, instead of the $0.50 on the gondola, it'll cost u a whopping $9.50!